I’ve always loved cooking and, above all, testing out exciting new recipes. 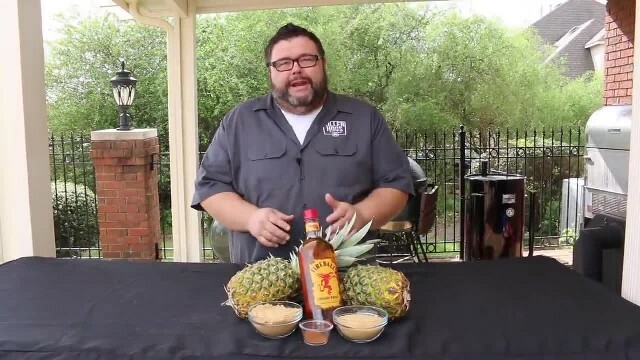 Using beer, wine or spirits in food might not be news, but have you ever heard of cooking with Fireball whisky? Fireball is a cinnamon-flavored whisky that’s been around since 1984 and has become extremely popular in recent years. When I came across this recipe, I immediately knew I had to try it, and I’m glad I did. I’ll definitely make it several times this summer because it’s the perfect side dish for hot dogs, sausages and ribs. It’s delicious, easy and fun to make, and above all, you’ll impress the guests, since none of them have probably tasted it before. 1. Peel the pineapples and cut a diagonal pattern half an inch deep on the outside of each one going in both directions. 2. Put both fruits in a resealable bag and pour in the Fireball. Squeeze as much air as possible out of the bag and close it. 3. Marinate the pineapples in the fridge for at least two hours. Flip the bag occasionally so the pineapples are completely soaked. 4. Light up your grill. It doesn’t matter whether you have a charcoal or gas grill, but having an automatic rotisserie helps. Otherwise, you can manually rotate the pineapples. 5. Mix the raw sugar, brown sugar and cinnamon in a bowl. 6. Put the sugar mixture on a plate and roll the pineapples in it. 7. If you don’t have a rotisserie, you can rotate the fruits on the grill yourself. Be careful not to burn them. 8. Grill until the pineapples have a golden brown surface. This takes about 45–60 minutes. When they’re half done, you can add more sugar to caramelize the surface even more. 9. Slice the fruit and serve as a side dish to any protein. Your friends will thank you after they taste this barbecue sensation. Don’t be stingy. Press the SHARE button so that others can try this unique recipe!